L'histoire de deux frères dont l'un passe sa vie chez lui. Tout en demeurant fidèles à leur esthétique fauchée, les coréalisateurs mettent en valeur le jeu très juste de leurs doués interprètes. 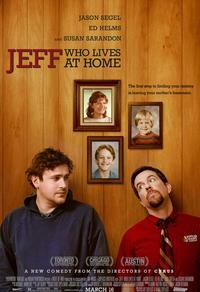 Jeff, Who Lives at Home is more consistent in its tone and coherent in its story. The camera moves with jittery compulsiveness, as though it were attached to the head of a high-strung puppy, but the effect is less irritating, and more expressive, than it was in Cyrus or the Duplass brothers' Puffy Chair. Even if you can't get into the storylines or are bothered by the Duplass' free-moving camera, the loveliness and heart of the characters is so deep that you can't help but want to appreciate them. Helms is solid as a stupefied Everyman, but it's largely the role he plays on The Office. And Segel's character simply isn't given enough back story; that his father died is tragic, but hardly an explanation for his oddball behavior. But Sarandon is worth leaving home for, even if Jeff won't. All told, Jeff Who Lives at Home isn't quite as good as Cyrus, but it's a unique, pleasant comedy that once again proves that the Duplass Brothers might be on to something with the way their films seem to simultaneously aim at the heart AND the funny bone. Jeff represents a generation looking for meaning, and Segel covers this terrain perfectly. Would it have worked nearly as well without him? Probably not, because thanks to his work here, it is a reminder that sometimes innocence and naivety are still important in life. The funny, touching and vital Jeff, Who Lives at Home reaffirms your faith in Jay and Mark Duplass. Their films hit you where you live. Two comedy stars tone down the laughs for tender outing by the Duplass brothers. This time around, Jay and Mark Duplass have enlisted two of today's greatest comic actors, Jason Segel and Ed Helms, to embody their special brand of misunderstood loser. Mais, et c'est là le plus surprenant, Jason Segel, Ed Helms et Susan Sarandon sont tellement bons à improviser leurs dialogues drôles et touchants qu'on croirait qu'ils ont eu un scénario, et très bien écrit en plus. Tout est présenté sans cynisme et sans vulgarité. Mais le public qui veut vraiment se taper sur les cuisses risque de s'y morfondre par moments et de s'énerver contre ces caméras inutilement grouillantes et d'excès de style qui paraissent ici superflus et fatigants.